The city of Chicago has a number of interstates passing through it, and almost every one has its own name. If you’ve ever heard a traffic report in Chicago, it can sound overwhelming and confusing. Where exactly are all of these sections of interstate, and how did they get their names? 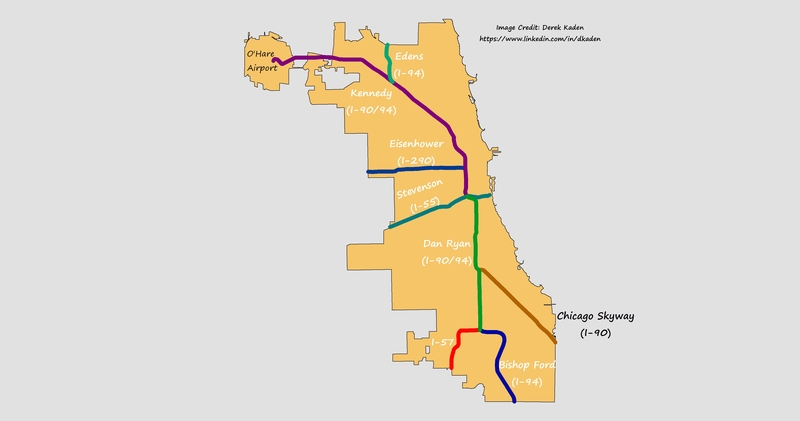 Today I put together a map to show you exactly where each part of an interstate starts and stops in Chicago, and I explain where each of these names come from. If you live here, hopefully this alleviates confusion the next time you listen to a traffic report, and if you live elsewhere, you will be a more well-seasoned traveler next time you’re passing through the Windy City. Kennedy – Completed in November 1960, it was originally named the Northwest Expressway until 1963. It was then renamed in honor of recently assassinated President John F. Kennedy. Dan Ryan – The Dan Ryan Expressway opened in December 1962. It was named after Cook County Board President…Dan Ryan, who was a supporter of expressway construction. Edens – Named after William G. Edens, who was a banker and advocate of paved roads early in the 20th Century. The Edens was the first Interstate in Chicago, and opened in December 1951. Eisenhower – First referred to as the Congress Expressway, and later named after President Dwight D. Eisenhower, its first stretch of completion was in December 1954. Famous Chicago journalist Mike Royko called I-290 Chicago’s only Republican Interstate, since Eisenhower is the only Republican political figure after which the Interstates were named. The Eisenhower is also the first Interstate in the United States to be fused with public transit (Chicago’s ‘Blue Line’). As Interstates are concerned, Eisenhower is the most important name on the list. He signed the Interstate and Defense Highways Act as President in 1956, which rapidly increased Interstate construction across the nation. This Act decreed that the Federal Government would cover 90% of all construction costs, while the State only had to pay 10. Stevenson – Opened for traffic in September 1964, this Interstate was originally known as the Southwest Expressway. Exactly one year later, the Interstate was renamed after Adlai Ewing Stevenson II. Stevenson was Governor of Illinois from 1949 to 1953. He was also the Democratic candidate for President in 1952 and 1956, where he lost decidedly both times against…Dwight D. Eisenhower! Bishop Ford – The Bishop Ford is a stretch of I-94 that runs around Lake Calumet and a large industrial corridor on Chicago’s far south side. Christened the Bishop Ford Memorial Freeway in 1995, it is named after Louis Henry Ford, who was a Bishop and an advocate of social justice. Chicago Skyway – Opened in April 1958, and originally referred to as the Calumet Skyway, this is one of only two sections of Interstate in Chicago that is not named after a person. I-57 – The only section of Interstate referred to by number. Unofficially, it is called Dan Ryan’s West Leg. But that just sounds a bit…strange.